John S. Tucciarone graduated from University with an Honours Degree in Political Science (Public Administration). He subsequently received his Law Degree from the University of Western Ontario. John Tucciarone was called to the Bar in 1996. He practiced in association with a senior solicitor in Richmond Hill, Ontario for 2 Years before commencing his own practice in Richmond Hill. 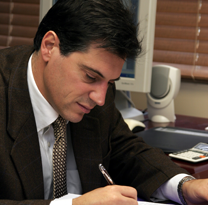 John Tucciarone moved his practice to Ajax, Ontario in 2002, at which time he became the successor to the very established law practice of Peter G. Singh, who had been practicing law in Ajax since 1969 in the same location. John Tucciarone continues to proudly practice law today in this same location under the firm name of Singh, Tucciarone, Barristers and Solicitors.